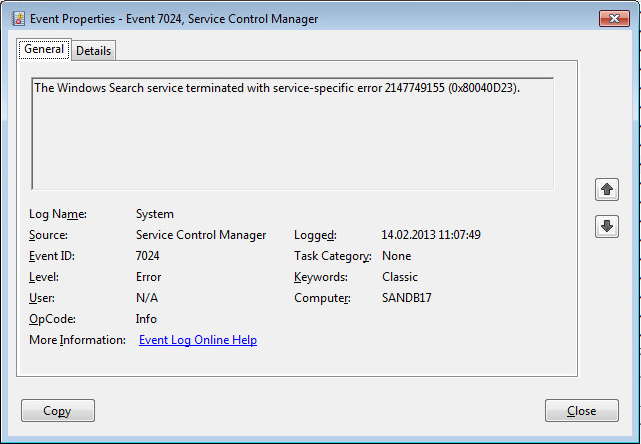 EventID 7034: The Windows Search service terminated unexpectedly. It has done this 4 time(s). EventID 9000: The Windows Search Service cannot open the Jet property store. No Windows Update File could installed by double clicking a msu File. 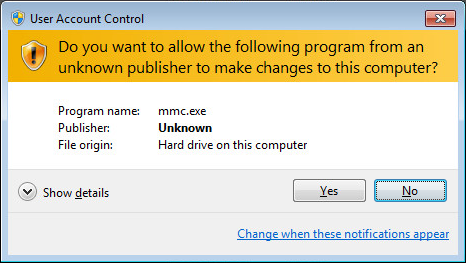 UAC Message: builtin executables could not verified. It seems that all services which uses the Window Jet Database engine are affected. My first thought was that the pc is infected by a virus. I have been run some virus scanner live CDs (Avira, F-Prot..) offline against the harddisk but no infection was detected. I also tried the following steps to make the computer run again. But this did not resolve the problem. So far so good. Next I looked to the eventlog to find the first time when the error occured. The point in time could exactly determined. I ask my friend whats happend there? And he could remember that at this time he replaces the harddisk with a newer, larger one. He cloned the old harddisk by an Imagetool to the new disk. But this is a standard procedure which I have often done successfully. Whats the difference? First I make an image of the old disk and then we cloned the new disk back to the old one. After booting the old disk all services run as expected!?!? Ok. I tooked a detail look into the disk. Something must be different. And so it was. The physical blocksize of the hard disks differs. The previous hard disk has a block size of 512Bytes and the new disk has a physical blocksize of 4096Bytes. The following Powershell command line list the physical block size of the hard disk where the boot partition is located. The command list all partitions at disk 0, gets the StartingOffset of each, makes a modulo division by 4096, if the rest is zero, alignment is ok otherwise a warning is printed out. For Windows Vista, 7, Server 2008 and 2008R2 a hotfix is available for improve compatibility with 4k physical block size. But the installation of msu files fails. I tried to install the hotfix offline(Not sure if this is absolute necessary). To do this, I dismounted the disk from the computer and connected them with a SATA <-> USB Converter to my working pc. The following steps descripes how to install a hotfix, for example the Windows Vista hotfix KB2553708, offline (in braces the pathes that I used). Get the fix, for the Hotfix KB2553708 a hotfix request is needed. Create a request and you will get an e-mail from microsoft with the download link. Add the hotfix to the offline Windows Vista Folder by executing pkgmgr (for Windows 7 use dism), specify a logfile to see whether the installation succeeds. After installing the Hotfix I placed the disk back to the computer and start them. The errors are still there. Now, I began to update several drivers step by step. After updating the Intel RST Rapid Storage Technoloy Driver all services starts as expected. From this it follows that older versions of the driver has problems to access new Harddisks with a physical blocksize of 4096 bytes correctly. Updating the driver to the most recent version will resolve the problem.